whether this caused or explained low achievement. and suggested that aspirations were actually very high across all social groups. 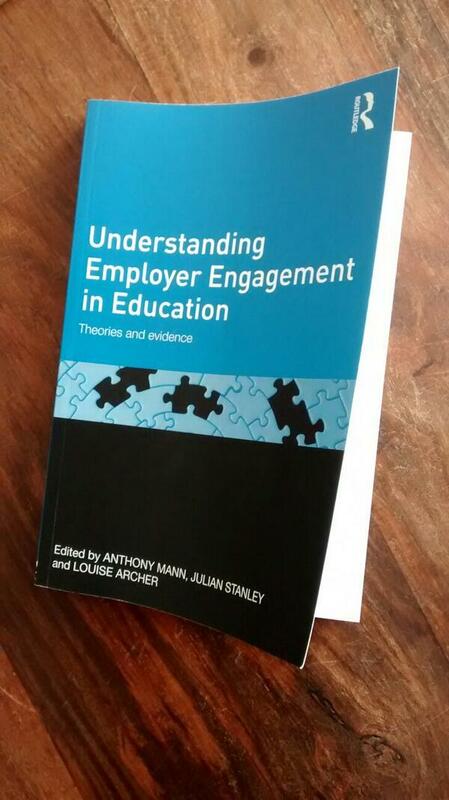 which ties very closely into “Understanding Employer Engagement in Education Ed by Mann, Stanley & Archer, Chapter 7 Local Labour Markets; What effects Do they have on the aspirations of young people?” by Ralf St Clair, Keith Kintrea & Muir Houston. Given the importance of families in shaping aspirations – and the lack of knowledge among many families about routes to particular occupations – supporting aspirations also mean working with parents more closely, especially where parents face disadvantages themselves. From this we might conclude that the first battle to embed the social, cultural and experiential capital needed by lower socio-economic groups to achieve the results and career outcomes for their children they aspire to, will be to persuade parents that they need that capital to begin with. Containing contributions from schools, colleges, professional bodies and employers, it covers a wide range of viewpoints from stakeholders on the current policy position for CEIAG in schools and gives some frank opinions on the gaps in the system and the challenges facing holding back improvement. If you’re pushing for extra support from line managers for your own CEIAG program in school or starting to plan for the new academic year, this might be a worthwhile read for your Senior Leadership team over the forthcoming summer break. Stanley and Mann also tease the possibility that, now the entitlement to universal work experience for 14-16 year olds has ended, it will be easier to test the actual impacts on student behaviour and outcomes rather than just collect stakeholder’s perceptions of impact. I would imagine the educational charities and foundations behind the employer engaged UTC and Studio School movement would be extremely interested in such data being crunched. At a time when, frankly, all areas of school expenditure are under pressure from Headteachers becoming nervous about budgets this sort of data is useful to know. It can add emotive weight to decisions of what (careers) work in schools should continue to receive the financial backing necessary to put on provision that can add real value to a youngsters educational experience. Everyone believes that work experience does, so let’s fight for it. The obvious answer is “yes, always” right? Without hesitation and by compulsion we should adhere stoically to the truth when offering guidance to clients. Perhaps delivered with compassion and understanding but ultimately the truth should always be aired. Whether we are utilising statistics and figures to illuminate the benefits or downsides of certain routes and destinations or to explain the expert guesses at the future labour market landscape awaiting our clients, the onus is on the professional capability of the adviser to be prepared and competent enough to have a range of sources on which to draw from that reflect the “truth.” The importance of this skill is considered such a key element of the role it is given it’s own Unit in the Level 6 Career Guidance Diploma. Sometimes, the actual reality of what statistics show is happening can be lost in our own personal experiences or subjective views as Nick Hillman, the Director of the Higher Education Policy Institute, discovered when confronting a room full of careers advisers convinced that the introduction of University fees was discouraging students from lower-income backgrounds to apply to H.E despite no current data to support this. Perhaps those advisers had personal, anecdotal stories which had blinded them to the wider world view or perhaps the data had just failed to get through the avalanche of numbers, figures and headlines that advisers try to keep up to date with about future labour market trends. The media (and those PR folk whose sole job it is to shout purely about their corner of the education world) don’t make this part of the job easy as the recent spate of headlines proclaimed that apprentices were now earning more than graduates shows. Which is all striking enough to get a Careers Adviser to take notice and feed into their messages of guidance. But was it the whole truth? A graph of recent ONS data shines a very different light on those claims. Questions around subjectivity can significantly impact and influence the message conveyed by individual guidance givers. Despite our own professional best intentions, our own media intake, reading and decisions will drastically alter the range of data and the perception of that data we use with clients even before we interweave the personal stories and experiences of both ourselves and our client into the mix. The impact of influences on the truth we convey and omit can be drastic. Let’s invent a client, a 15-year-old female student called Laura, studying at a regular English secondary school. Let’s imagine she’s bright and able to do well in her subjects with hard work. She’ll need to be, Laura is from a home eligible for Free School Meals so is 26.5% less likely to achieve A*-Cs in her Maths and English GCSEs than her classmates who do not receive FSM. If the school Laura attended was in Grimsby or Bradford, this hard work would be needed to insulate her from becoming the quarter of her age group who will become NEET upon leaving school. Let’s say Laura is on course to negotiate these initial hurdles and has expressed an interest in studying at the local Sixth Form College, which has navigated the pressures on their funding to still offer the STEM courses Laura is interested in. The closer she gets to her GCSE exams, it becomes clear that Laura may be on target for some excellent results which, considering her Afro-Caribbean heritage, means she would be outperforming her peers who remain the lowest performing ethnic group in British schools (para 1.3) . Teachers start talking to her about the differences in University options and light a fire in her to investigate the exclusive world of the Russell Group. Her fears about the average £44,000 of debt her studies will leave her paying into her 50s are allayed (much to Nick Hillman’s cheer) with the tantalising promise of bursaries to help her despite that just a third of students receive £1400 a year. Achieve the outstanding grades required and you’ll have a great chance, she is told, despite the truth that her heritage and her state school education make it much less likely she would receive an offer compared to other students with the same grades. and could be even more greatly affected by her decision to stay near her family home in the north of England. Careers advice, like politics, is the art of the possible. In fact much of the rationale for the existing of career guidance as part of public policy is the fact that helps individuals to make their way through sub-optimally organised systems. so at which point should the full extent of just how “sub-optimal” the system is be shown? At which point does the “possible” become narrowed to reflect the reality rather than expanded to reflect the ambition? I’ve blogged before on framing Labour Market Statistics not as a dissuading element but as a motivator to encourage students to push on and achieve their dreams but Nick’s piece made me consider a deeper truth in my own practice in adhering to the statistics. Through omission and selection, I do not always “tell the truth.” I choose which facts and statistics to unveil to students that I think will motive and encourage them at opportune and transitional points and through that, hope to play a small role in the process as they move forward to see their version of the “truth” themselves.